Many of you may have heard, I have been authoring the recent May I Introduce You To series on GeneaBloggers. This has been a great experience and I have been learning so much! I am fairly new to the genealogy blogging circuit and actually blogging in general. I had many fears about starting my own genealogy blog: I felt that others would not be interested in reading what I had to share on my blog. Also, I have only been doing my own family history for less than two years, without much research or family history experience under my belt, so there really wouldn’t be a lot of material to post about yet. In addition, I was working full time up to October 6th, but now I am gratefully retired, as I want to pursue genealogy almost full time. I feel I have found something I love to do - now, I just need to learn to improve my writing skills and stlye for my blog. Being a part of the genea-blog family as I call it has taught me so much about many different things that I would not have learned had I not started blogging. Writing the May I Introduce You To articles has given me the opportunity to improve my writing skills. 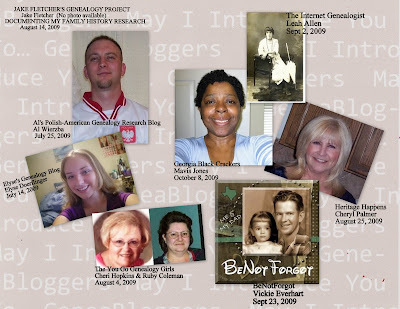 I love doing the articles and learning about other genealogy bloggers, how they started their blogs, what their fears about blogging were in addition to understanding their heritage and history. There are so many incredibly talented and knowledgeable people who make a difference in so many of our lives and the lives of others. It is my pleasure to write the articles and get to know many of you. I want to thank GeneaBloggers for such a great opportunity. It just doesn’t get any better than this! If you haven’t had the opportunity to read the articles I have featured so far, click on the blog links below and enjoy…leave a comment to let them know you stopped by. I look forward to featuring many more of you in the future. One of our youngest genealogy bloggers, Elyse brings fresh and new ideas to genealogy blogging. 25 July 2009 ~ Al's Polish-American Genealogy Research Blog by Al Wierzba Researching and sharing his Polish-American ancestry. Jake’s wonderful experience of his internship at the New England Historical Genealogy Society. Where Cheryl’s heritage is always happening. Rich in family history and amazingly creative. Sharing her long time research about her African-American family history. If you would like me to feature your blog, please feel free to email me at: ginisology@gmail.com -I would love to share you with the genealogy blogging community. The May I Introduce You To?…. is a feature of GeneaBloggers. What a neat thing for you to do, Gini -- good job on the collage! Thank you for doing this "round-up" of your amazing interviews -- I know I enjoyed doing mine with you! V. . . . P.S. I "tweeted" this for you. Be sure you let me know when you get that twitter account set up! Thank You Vickie, it was truly a pleasure getting to know you and sharing your amazing blog. Watch for me twittering and tweeting about, it will be soon! Echoing the wonderful job that you are doing. I've enjoyed reading about other bloggers and was shocked and thrilled when you recently introduced me. Keep up the good work! I really enjoy this series and am so thrilled that you're the one writing it. Keep up the good work! Amy Thank you, I cannot tell you how much it means to me to have your support and wonderful words. It is fun to do and I love doing it. Mavis it was a pleasure featuring you, I very much enjoyed getting to know you and your blog much more. Thank you Terri, knowing that others are enjoying the articles and support me really gives me the courage to write them. It is so much fun getting to know others, I just love doing it. GeneaBloggers is a wonderful place for all of us to connect and share. 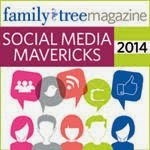 We have such a wonderful genealogy blogging community! I love your blog. Thanks for visiting mine.